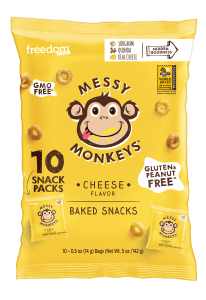 Are Messy Monkeys Halal and Kosher Certified? 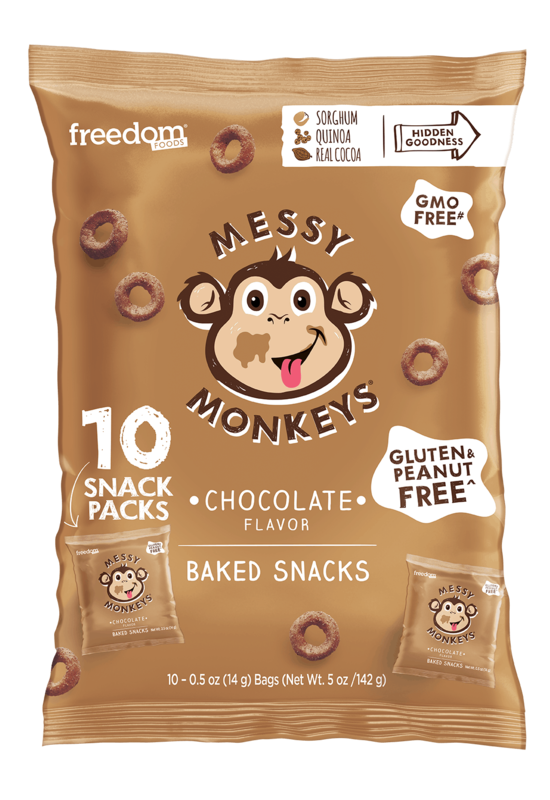 Messy Monkeys are not Halal and Kosher certified at the moment. 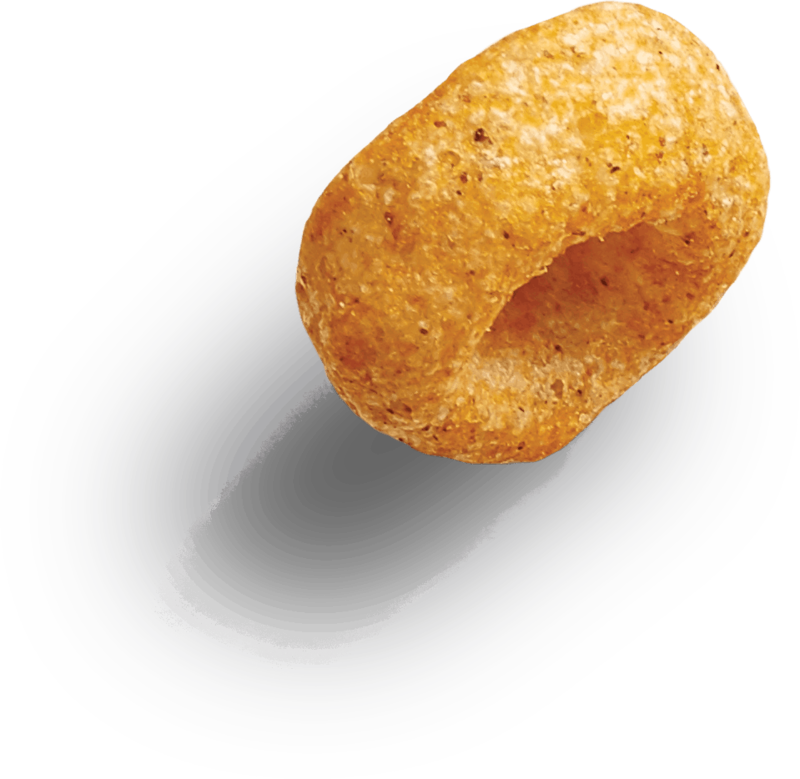 We are currently in the process of obtaining American Kosher Certification. What is the Daily Reference Intake (DRI) of fiber for children? What age is Messy Monkeys suitable for? 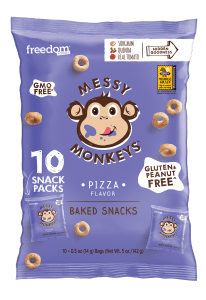 Messy Monkeys is suitable for children entering the world of whole foods and older.Please take care with children less than 4 years as small pieces may present a choking hazard. Why is Sorghum considered a Nutrient Powerhouse? Sorghum is also a gluten free grain and low on the glycemic index. What are the benefits of the Ancient Grain Quinoa? Quinoa is a gluten-free seed that provides a complete protein source, meaning provides all essential amino acids. It has a protein to carbohydrate ration of 1:4.3. It is also a high source of Manganese, Magnesium, and Phosphorus. Storage instructions: We recommend storing our Messy Monkeys in a cool dry place. To keep it fresh after opening, store in an airtight container. Does Apple & Cinnamon flavor contain…? *Product manufactured in a factory which does not use, and tests for the presence of peanuts. Please note the factory does process other treenuts. 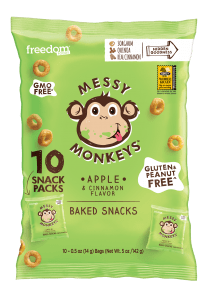 Are Apple & Cinnamon Messy Monkeys vegetarian or vegan suitable? Yes. 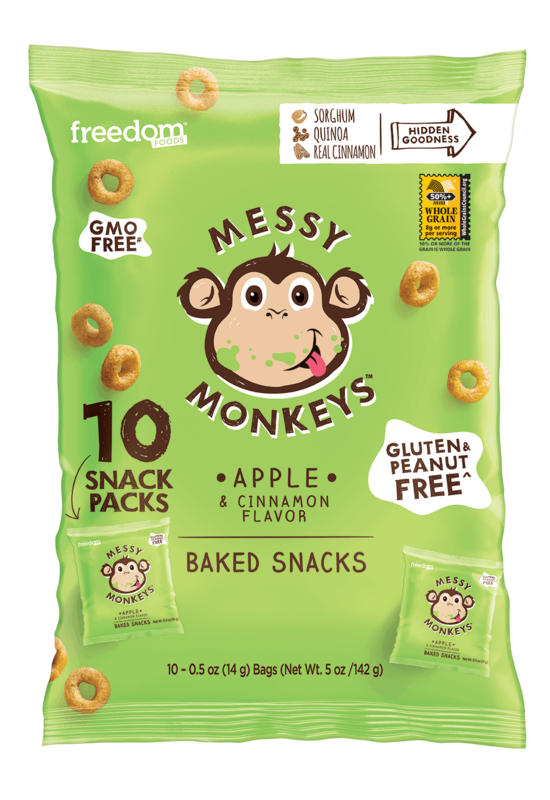 Apple & Cinnamon Messy Monkeys do not contain any animal-derived ingredients. What is the flavor in Apple & Cinnamon? Are Cheese Messy Monkeys vegetarian or vegan suitable? No. 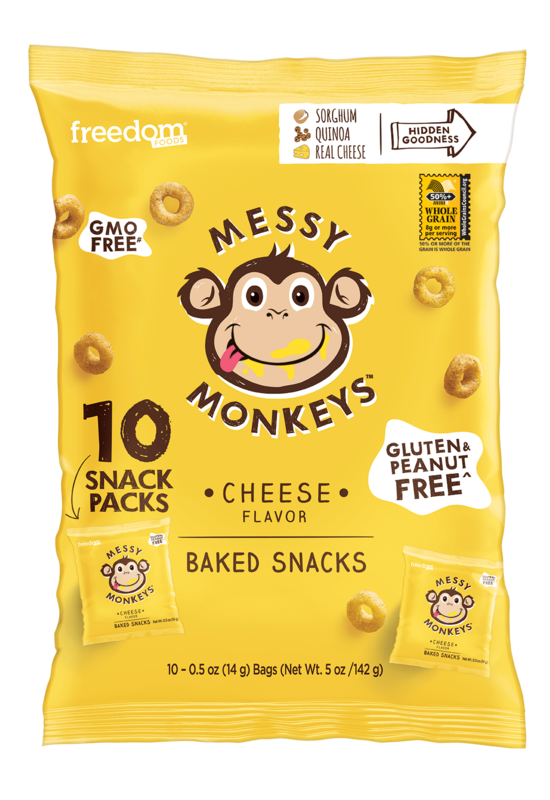 Cheese Messy Monkeys does contain animal derived ingredients. What is the flavor in the cheese? The Cheese flavor is made up of Cheddar Cheese seasoning which includes Milk, Salt, Cultures and other Enzymes typically used to make cheese. Are Pizza Messy Monkeys vegetarian or vegan suitable? No. 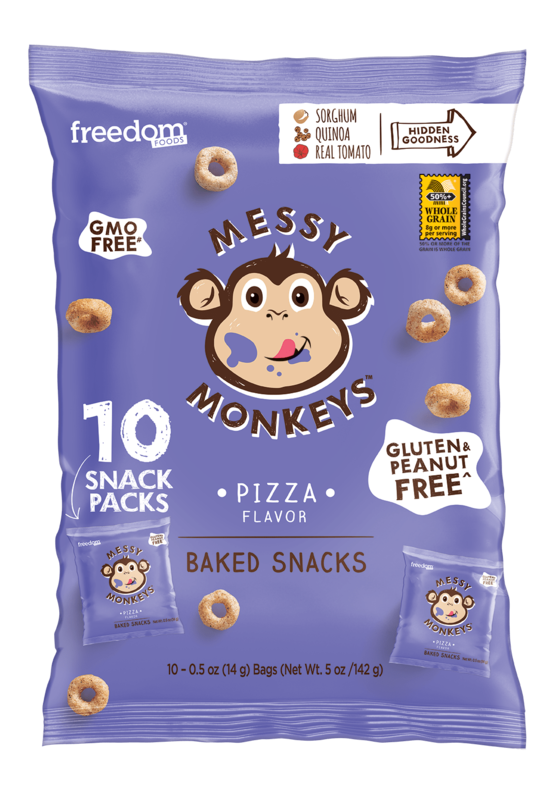 Pizza Messy Monkeys does contain animal derived ingredients due to the milk present in the cheese seasoning. What is the flavor in the Pizza?